Burkitt's lymphoma (BL) is a type of non-Hodgkin's lymphoma (NHL) that is sometimes called a B-cell lymphoma or small noncleaved cell lymphoma. Burkitt's lymphoma is one of the most rapidly growing forms of human cancer. In addition, the number of new cases of this tumor is rising in most countries. Of all cancers involving the same class of blood cell, 2% of cases are Burkitt's lymphoma. •	The endemic variant ( eBL ) occurs in equatorial Africa. It is the most common malignancy of children in this area. Children affected often also had chronic malaria, which is believed to have reduced resistance to Epstein-Barr virus (EBV), allowing it to take hold. The disease usually involves the jaw or other facial bone, distal ileum, cecum, ovaries, kidney or the breast. •	The sporadic type of Burkitt’s lymphoma ( sBL ) is another form of non-Hodgkin lymphoma found outside of Africa. 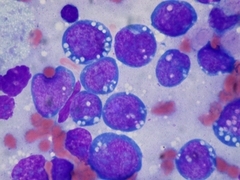 The tumor cells have a similar appearance to the cancer cells of classical African Burkitt’s lymphoma. Again it is believed that impaired immunity provides an opening for development of the Epstein-Barr virus. The jaw is less commonly involved, compared to the endemic variant. The ileo-cecal region is the common site of involvement. •	Immunodeficiency-associated Burkitt’s lymphoma is usually associated with HIV infection or occurs in the setting of post-transplant patients who are taking immunosuppressive drugs. Burkitt’s lymphoma can be one of the diseases associated with the initial manifestation of AIDS. HIV-associated BL characteristically involves the lymphnodes and bone marrow. Studies suggest that eBL and sBL differ in geographical distribution and degree of association with EBV. eBL occurs primarily in equatorial Africa and Papua New Guinea, and has a 95% association with EBV. sBL, which accounts for 1%-2% of adult lymphomas and 30% 50% of pediatric lymphomas in the United States (US) and Western Europe, occurs in all other parts of the world, but has only a 15% association with EBV. While eBL primarily affects children 4-7 y, sBL is seen in both children and young adults, having a median age of 30 y. For all three types of BL, males are more commonly affected than females. In children, symptoms may appear as soon as four to six weeks after the lymphoma begins to grow. The more common symptom pattern is a large tumor in the child's abdomen accompanied by fluid buildup, pain, and vomiting. If the lymphoma begins in the blood marrow, the child may bleed easily and become anemic. In adults, the first symptoms of Burkitt's lymphoma may include swelling in a lymph node in the upper body or a swollen and painful abdomen. If the tumor is located in the chest, it may put pressure on the airway and cause difficulty in breathing. There may be unexplained itching or weight loss. Other patients may have more general symptoms, such as fever or a loss of energy. Adults with AIDS often have tumors developing in several different locations in the body by the time they are diagnosed. Burkitt's lymphoma is usually diagnosed by examining a piece of tissue from a surgical biopsy of a swollen area in the patient's body—often the jaw area in endemic Burkitt's or the abdomen in the sporadic form. The tissue is examined under a microscope. In Burkitt's lymphoma, the tumor cells will show a very high rate of cell division and a characteristic "starry sky" pattern. The tumor consists of sheets of a monotonous (i.e. similar in size and morphology) population of medium size lymphoid cells with high proliferative activity and apoptotic activity. The "starry sky" appearance is due to scattered tingible body-laden macrophages (macrophages containing dead body of apoptotic tumor cells). The pathologist may also test the tissue sample for the presence of EBV, which is found in about 30% of patients diagnosed with Burkitt's lymphoma in the United States. 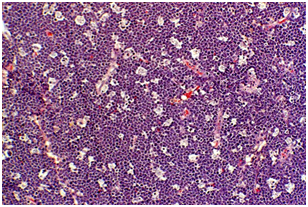 Figure 3 - Burkitt's Lymphoma "Starry Sky"
In addition to a tissue biopsy, the patient is also given a complete blood count (CBC) test, a platelet count, and a lumbar puncture (spinal tap). Tumor cells in Burkitt’s lymphoma generally strongly express markers of B cell differentiation (CD20, CD22, CD19) as well as CD10, and BCL6. The tumor cells are generally negative for BCL2 and TdT. A feature observed in nearly 100% of BL is a reciprocal chromosomal translocation involving the proto-oncogene MYC on chromosome 8 and one of the Ig gene heavy or light chain loci on chromosomes 14, 2, or 22. The translocation to an Ig locus leads to deregulation and constitutive expression of c-myc, with an overall effect of uncontrolled proliferation as well as a reduced threshold for induction of apoptosis. MYC encodes the c-myc transcription factor which was first discovered nearly thirty years ago as a cellular homologue of an avian retroviral oncogene. Since that time, MYC has been recognized as one of the most commonly activated oncogenes in human cancers. It is estimated to play a role in 20% of all cancers. c-myc is a transcription factor belonging to the class of basic helix/loop/helix/leucine zipper proteins. 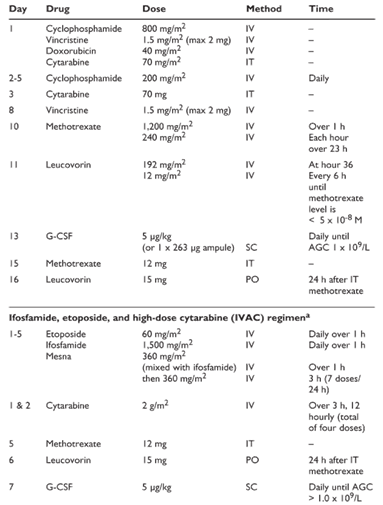 Under normal conditions, c-myc is activated in response to mitogenic factors and repressed upon exposure to antiproliferative signals. Overexpression of cmyc contributes to proliferation by inducing the activity of cyclins, while at the same time repressing the activity of the cyclin inhibitor p27. The proapoptotic properties of cmyc involve both the extrinsic (through interactions with TRAIL) and intrinsic (through interactions with p53 and Bim) pathways. When taken together, these properties explain the observation that BL cells have a high proliferative index while remaining susceptible to apoptosis. In cases of BL that are negative for MYC translocations, downregulation of the miRNAs let-7c and miRNA-34b (which negatively regulate c-myc mRNA translation) has been observed and postulated to be the cause of c-myc overexpression. EBV, or human herpesvirus 4, is the virus that causes infectious mononucleosis: EBV is a member of the herpes family of doublestranded-DNA viruses. Worldwide more than 90% of all people become infected with EBV at some point during their lifetime. Though most infected individuals remain healthy, EBV is capable of leading to pathologic conditions, being linked to a variety of human diseases and malignancies. EBV also has the potential to transform normal human B lymphocytes into continuously growing immortalized cells such as BL and B lymphoblastoid cells. It is present in approximately 50% of Hodgkin’s Lymphoma and is found with varying frequency in NHL. EBV is implicated in infectious mononucleosis, T-cell lymphoma, adult T-cell leukemia, Natural Killer cell (NK) leukemia, post-transplant lymphoproliferative disorder, nasopharyngeal carcinoma, and various other lymphoid and epithelial malignancies. In most individuals, infection of B lymphocytes by EBV is followed by a cytotoxic CD8+ T cell (CTL) response that controls the spread of the virus. In spite of this vigorous CD8+ T cell response, a population of infected B cells escapes immune-mediated elimination. Immunodeficiencies resulting from certain genetic disorders, organ transplantation, or infectious diseases (e.g., AIDS, malaria) can lead to reactivation and outgrowth of these EBV-infected B cells. 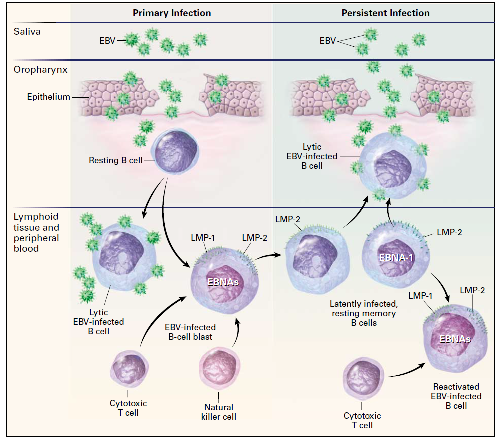 Figure 7 - Model of Epstein–Barr Virus (EBV) Infection in Humans. In the oropharynx, EBV directly infects resting B cells or infects epithelial cells, which in turn infect B cells. 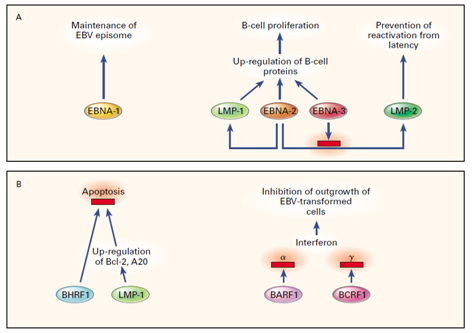 During primary infection, EBV-infected B cells undergo lytic infection with production of virus or express the full complement of latent viral proteins. The latter cells are kept in check by natural killer cells and cytotoxic T cells. After convalescence, EBV is present in the peripheral blood in latently infected memory B cells that express latent membrane protein (LMP) 2 and possibly EBV nuclear antigen (EBNA) 1. The latter cells can undergo EBV reactivation and express other latent viral proteins, resulting in their recognition and destruction by cytotoxic T cells. Some latently infected cells undergo lytic replication in the oropharynx, resulting in production of virus with shedding of virus into the saliva or infection of epithelial cells with release of virus. EBV is known to be associated with BL to varying degrees, but the exact role that it plays in the development of BL has remained elusive. It is known that EBV is capable of transforming B cells and this may play a role in the pathogenesis of BL. 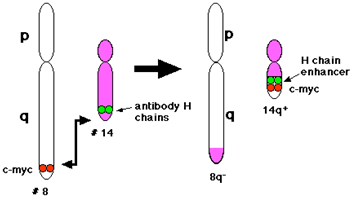 The entry of EBV into B cells involves at least five viral glycoproteins. EBV binding is partially mediated by the viral envelope protein gp350 which binds to complement receptor 2 (CR2) on B cells and attaches the virus to the B cell, allowing viral gp42 to bind to HLA class II proteins. Upon binding of EBV to the B cell, gp42 triggers membrane fusion which is carried out by the viral proteins gB, gH, and gL. Latency I, associated with BL, is characterized by expression of EBNA1 and small noncoding EBV RNAs (EBERs). Latency II, associated with HL, is characterized by expression of EBNA1, LMP1, LMP2, and EBERs. Latency III, observed in posttransplant lymphoproliferative disorders, includes expression of all EBNAs, EBERs, and LMPs. EBNA2 is one of the first viral protein to be expressed following infection of B cells and its expression is required for transformation. It works in concert with EBNA-LP to activate cyclin D2, driving the B cell from G0 into G1, and its inactivation results in cell-cycle arrest and entry into apoptosis. Comprehensive screening has identified 550 cellular genes that are either significantly induced or repressed by EBNA2, including MYC. Among the viral genes under transcriptional control of EBNA2 are the transmembrane proteins LMP1 and LMP2A. These proteins mimic normal B-cell molecules and deliver growth and survival signals commonly seen in B-LCL. LMP1 functions as a homologue of CD40 and signals through the tumor-necrosis-factor-receptor-associated factors (TRAFs) that result in activation of the transcription factor NF- kB, leading to cell survival and growth. LMP2A performs a similar function by mimicking the signaling of the B-cell receptor (BCR). In addition, EBNA3C has a role in cell cycle progression through degradation of the tumor suppressor protein, pRb. 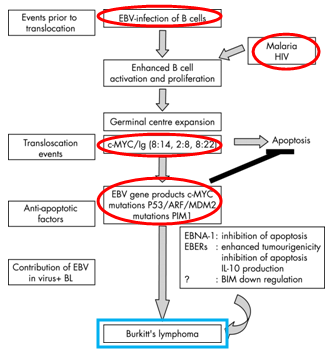 Figure 8 – Activities of Selected Epstein–Barr Virus (EBV) Proteins That Are Important for Latent Viral Infection (Panel A) or Evasion of Host Immune Responses (Panel B). Overexpression of c-myc drives cells into the cell cycle, but it also leads to apoptosis in the absence of apoptosis-inhibiting signals. These signals may be provided by other oncogenes, such as ras or bcl- 2, or in the case of EBV-positive BL by EBNA1, which is antiapoptotic. Prevention of the endemic form of Burkitt's lymphoma is complicated by the high incidence of malaria in central Africa combined with inadequate medical care. In other countries, some risk factors associated with the sporadic form can be lowered, most particularly lifestyle behaviors that increase the risk of HIV infection. In addition, patients with Burkitt's lymphoma may want to consider genetic counseling because of the role of the C-myc oncogene in their disorder. •	Stage I: The lymphoma is either limited to one group of lymph nodes either above or below the diaphragm, or is in an organ or part of the body other than the lymph nodes, but has not spread to other organs or lymph nodes. •	Stage II: The lymphoma is either in two or more lymph node groups on the same side of the diaphragm, or is in only one organ or site other than the lymph nodes but has spread to the lymph nodes near that organ or site. 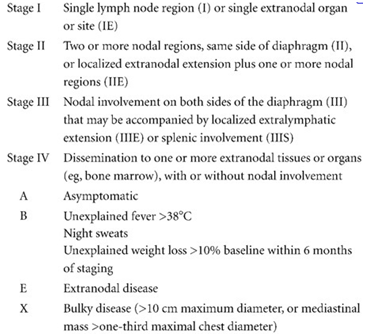 •	Stage III: The lymphoma is present in groups of lymph nodes on both sides of the diaphragm. It may involve an organ or site outside the lymph nodes, the spleen, or both. •	Stage IV: The lymphoma is disseminated (spread) throughout one or more organs outside the lymph nodes. There may or may not be involvement of lymph nodes that are remote from the affected organs. The most commonly used staging system for NHL in children is that of the St. Jude's Children's Research Hospital. It separates patients with a single tumor or diseased lymph node (Stage I) or two or more tumors or diseased lymph nodes on the same side of the diaphragm (Stage II) from those with a large chest or abdominal tumor (Stage III) or involvement of the bone marrow and central nervous system (Stage IV). Early treatments for BL sought to use chemotherapy regimens that were being used for other NHL. However, when used for BL, they showed far inferior responses and cure rates, and these results were attributed to BL’s rapid doubling time. To overcome this, intensive chemotherapy with short intervals between treatments was explored as an option. These regimens showed improved responses, but increased treatment-associated toxicities. An additional confounding factor is coinfection with HIV, in which aggressive chemotherapy further aggravates their already immunodeficient state and leads to severe toxicities. Immunotherapeutic treatment of BL is found in the form of the anti-CD20 monoclonal antibody, rituximab, which induces cell death in B cells by cell-dependent cytotoxicity, antibody-dependent cell-mediated cytotoxicity, or complement activation. Rituximab used in conjunction with chemotherapy has led to increased response rates in BL patients. However, toxicities from the chemotherapy are still an issue in many patients, and additional immunosuppression resulting from the use of rituximab is also a concern for HIV-infected BL patients. More recently, the anti-CD22 monoclonal antibody, epratuzumab, has entered clinical trials and shows a synergistic effect when used concomitantly with rituximab. Other treatments are immunotherapy, bone marrow transplants, surgery to remove the tumor, and radiotherapy. Treatment with dose-adjusted EPOCH with Rituxan (rituximab) has shown an 8 year survival rate of 91% for low risk, 90% for low-intermediate risk, 67% for high-intermediate risk, and 31% for high risk cases with few of the side effects associated with Burkitt's lymphoma chemotherapy. In adults, overall 5-year survival rate is approximately 50%.